Sunday May 19th at the Exchange Place Starbucks Angel proposed to Katherine and Katherine said yes. Cold, rainy, and fog… quiet… late afternoon turning into evening. Stir It Up by Bob Marley kept repeating through the sound system speakers. The manager, who was pacing by the entrance, apologized to the few patrons drinking their beverages here on this dreary day, about the Reggae classic being played on a loop. A couple is going to get engaged here, he explained, and they want this to play in the background… the song ends, begins, ends, begins… time passes… finally a group of very well dressed young folk emerge out of the parking garage from across the cobble stone street. They were Jehovah Witnesses, coming from the Stanley Theater, in Journal Square, where every Sunday the denomination congregates for services. Close to 20 of them, a very nice looking bunch, dressed in their Sunday Best, young. They’re wearing wonderful clothes and they’re all enthusiastic… everyone knows what Katherine is about to find out. The group forms a long line at the register. May I take your order, says the young woman at the register, garbed in apron, cap on her head. The song changes to Marry Me by Train (contemporary soft-rock, unfamiliar to me). Angel is a tall fellow, wearing a gray suit; Katherine turns around to face him as he gets down on one knee. She’s shocked, takes a few moments before she begins to understand. Their friends form a semi-circle around the couple, cameras and phones are aimed. He takes her hand and slips the ring on her finger. 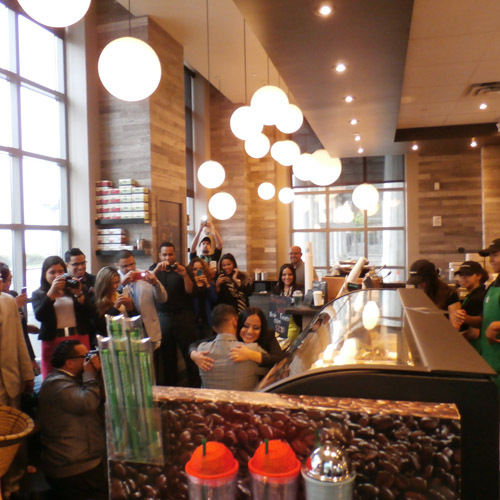 It was all planned of course – walking into Stir It Up, the proposal coming during Marry Me – Katherine is obsessed with Starbucks, which was why this proposal, here, today, was so unexpected. This was just supposed to be some Post-Stanley Theater coffee, just any other Sunday. Her friends selected the Exchange Place location, because it has the best view of the Hudson and NYC. The rain and the fog obscured the splendor of Manhattan and the mighty river between us, but we joined the Jehovah Witnesses in witnessing Angel proposing and Katherine accepting. Love again anew, love again acknowledged, love again shared.